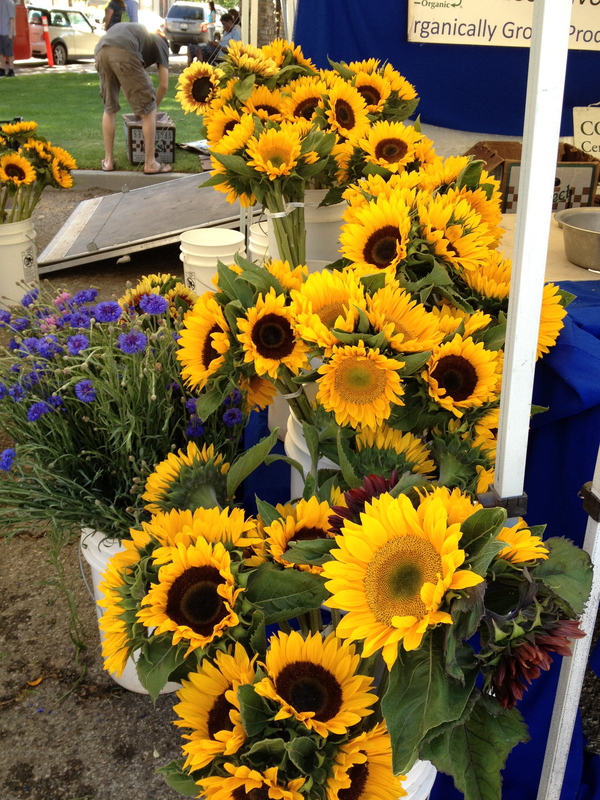 I did buy some of these beautiful sunflowers. I am just going to say it…. I have a problem, a big one, with the beautiful and innovative farmers’ market that just opened up in my neighborhood a little over two weeks ago. I bounded to the market with so much excitement its first day, but as much as I wanted to, I couldn’t love it. First, let me sing its praises. Location, location, location. This market’s setting is one of the best I have seen in the Los Angeles area. Nestled in a small parking lot between a large community garden and an open grassy area lined with large trees, it is really beautiful. One can enjoy farmers’ market treats in the shade of the trees while the little ones run to their hearts’ content. The market vendors are exclusively organic sellers and many of them are (sub)urban farmers, some selling at market for the first time (with the help of the organizer). Read this Los Angeles Times article for more on that. I love that some of the vendors are as local as they come, but this, in turn also contributes to the problem I have with this market. It is a complicated issue. So, let’s go back to location. 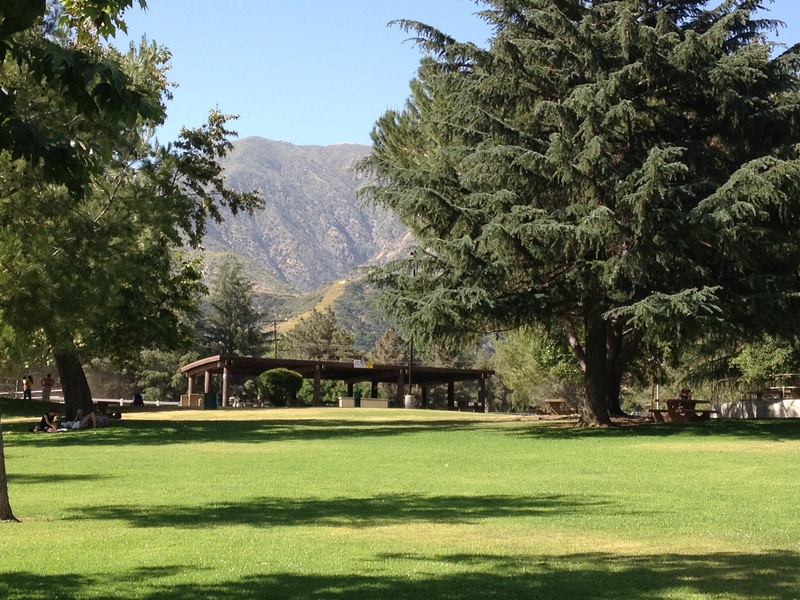 Altadena is an unincorporated area of Los Angeles County with a population just shy of 43,000 people. The north east section of Altadena is home to very large, manicured estates. There is a lot of wealth in east Altadena, as well as many middle income families. West Altadena is of very mixed income, middle class and working class families live side by side. 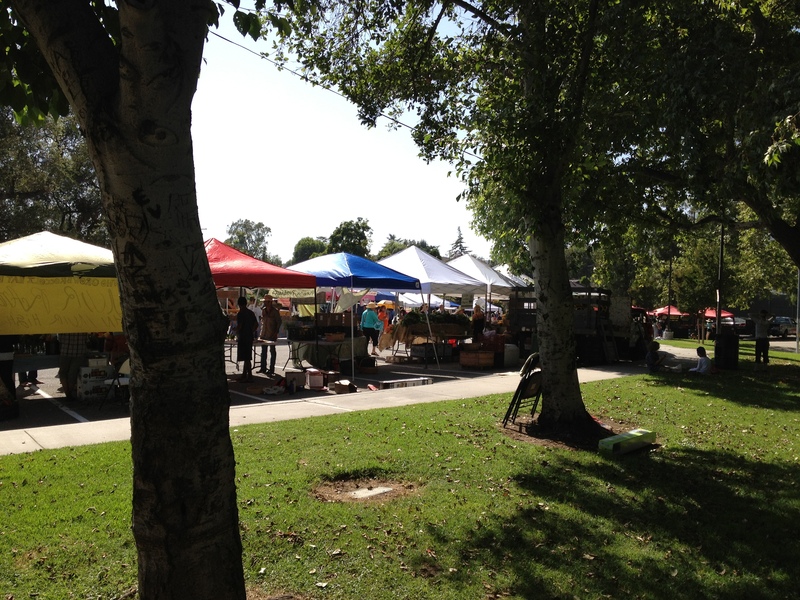 The Altadena Farmers’ Market is located in west Altadena. This is why I can’t love this market. I feel the intent of a farmers’ market should be to make local, fresh produce accessible to people living in urban/suburban areas. They provide shoppers with more variety, and possibly a wider choice of organic fruits and vegetables. I have been to the market twice (it has only been open for two weeks). I spotted artichokes for $4 a piece, and a dozen eggs for $7.50. Of the prepared items, tiny containers of goat cheese for $6, pickles for $8, and loaves of bread for $5. I am in no way criticizing the farmers and producers that come to the market with these prices. I am sure they are not getting rich, and may only be barely covering their costs or making a profit. These are farmers of a very small scale that don’t have access to the subsidies of industrialized agriculture. But, as I walked through the market that very first day, it was glaringly clear that this market, by the nature of the prices, excludes a large portion of Altadena residents (including myself, to some extent). I think, generally, farmers’ markets can be more expensive than some grocery chains, but this one is way more expensive. I know that a large part of the struggle for food justice and sustainable eating will have to be done on the policy side. Changing government policy to support sustainable farming methods would help these farmers sell their produce for less. Supporting local farms and (sub)urban farms is also part of the solution. But, true food justice will come when everyone has access to fresh, sustainably grown food that comes from farms that embrace fair labor practices. While we work toward that I think that we have to be vigilant in creating balance and not create spaces that only those in the upper economic sectors have access to. The view from the edge of the market. Will I go back to this market? Yes. I may go from time to time to get a couple of items or enjoy some ice cream. I will have to stick to other nearby farmers’ markets to do the bulk of my shopping. I cannot embrace the Altadena Farmers’ Market whole-heartedly, nor can I afford to. I would love to open up a dialogue, to hear your thoughts about these issues. Please leave a comment, if you are so inclined. I can’t say I disagree with you Jess. When I drove by during the first week I laughed at how it looked like the latest L.A. hipster scene. I also noticed the neighbors on the same street as the market just watching this new crop of people arrive in their neighborhood, which some have lived in for 40 plus years. If the market really wants to be known as the “local, sustainable market”, it would be beneficial for them to consider their local people/shoppers in the area. The leaders of the market should mail all West Altadena residents 50% “local shopper” cards that residence can bring to the market with id. To every problem, there is a solution………….. This is what made me so sad. I haven’t talked to the organizer myself, but I do wonder what kind of consideration was made for the actual residents of the neighborhood. I admit I had some of these same thoughts. I think these sorts of prices are probably too high for many people throughout Altadena. My first thought about it was that I hoped it didn’t spell the demise of the market. And to be totally honest I love some of the vendors at this market. I like those cute little organic lettuces, and we tried the bread last week and it was good! And while eating from the wood fired pizza bus is delicious, it will probably only be an occasional treat. I do really like this market, so my hope for it is that it will do well enough to expand to include more vendors perhaps with more price variety(maybe some non organic or non-certified but growing organic) so more can shop there. I love some of the vendors too. And I really love the idea (suburban/urban producers) of the vendors as well. I also wondered if the prices spelled demise for the market. My hope is that it does expand to provide more variety and accessibility for the local residents and residents all over Altadena. P.S. After reading your comment, I realized I hadn’t characterized East Altadena very well. I did some editing. Thanks! You’ve hit the nail on the head. This is a HUGE problem of the local food movement that not a lot of people want to talk about. Joel Salatin address the issue in his talks. He advises farmers selling at market to carry a chocolate bar in their pocket to illustrate what folks are willing to spend per pound for a piece of (crap) chocolate vs. what they’re willing to spend per pound on meat or veggies. It’s a good argument, but I think misses the point. Before I grew my own, I bought a (not very big) bag of heirloom tomatoes at my local market to can. 50 bucks!!! I almost had a heart attack. Not sustainable. I go to my local market to pick up honey and for the ambiance, but other than that, I buy direct from farmers or grow my own. It’s better for them and me both financially AND practically. Most markets here require the farmers to be the ones selling. Doesn’t leave much time for farming. Our markets here tried to get a coupon program going for folks on public assistance, but last I heard it stalled for lack of funding . . . The markets here in Vancouver are wildly successful and growing in size and number every year, so someone must be shopping. But I suspect it’s mostly people who can either afford to splurge or who are like you and I, going for a treat and the experience. Great post and an important issue! Here, there are farmers’ markets in all kinds of neighborhoods and many of them accept Food Stamps along with coupons from various other assistance programs. This one that I write about is an outlier in terms of prices. Fortunately, for me, there are about 4 other farmers’ markets within a 5 mile radius that I can go to pick up some fresh, locally grown produce. Unfortunately, for me and other Altadena residents, our options to obtain produce as well as other groceries is extremely limited in our immediate area. Many people travel outside of Altadena and into neighboring cities to get groceries. In terms of the larger movement, yes. yes, yes. I have kind of stayed on the fringes, am doing some research, exploring to see what people are doing. The problem is multi-faceted and everyone must have a voice in the dialogue and have say in the direction of movement. superbly expressed, and yes a great subject for a discussion. Your words “But, true food justice will come when everyone has access to fresh, sustainably grown food that comes from farms that embrace fair labor practices” really summed it up to me. I grow as much of my own food as I can. But for most people that isn’t attainable, and the cost of organic or locally sourced food is simply out of their reach. But for me, my priority is always fair trade – I think if this is sorted (sighs) then all else will follow…. add another sigh! My issue is a lack of variety. In Central Ohio, there is a circuit of farmers markets in most of the middle-and higher- class suburbs. There’s a market about 15 minutes away any given afternoon in the summer. I consider it a circuit because most of the vendors are the same at each market. Same products at same-as-Whole Foods prices. Downtown Columbus is home to our North Market which is more of a specialty foods spot than true farmers market. there is a little bit of produce here but it’s not a destination for me unless I’m looking for a unique bottle of wine or novelty hot sauce. There are 2 markets that I have yet to try. One is an actual store on the rural edge of our nicest suburb. Most of the celebrities who live here like Eric Clapton live only a few streets away from this market. Ive heard their prices are actually reasonable though. The other is a Saturday market near the OSU campus where there is a fun mix of students, small families, artists etc. Ive heard there is a nice variety of vendors at that one. I’m going to try these others in the coming weeks but what I’ve found so far is very vanilla market experience. That is unfortunate that you don’t have more of a selection.I do think that smaller farmers face an uphill battle in terms of government assistance, making it tough to compete against the large farms. I do think though that for this movement to go forward, it is important to address the needs of shoppers who are looking for fresh produce that they can afford. This includes people of all income levels. Wow! Reading about what you pay made my jaw drop. Yes, California is a whole other ball game, and Altadena is part of the Los Angeles Metropolitan area. There are other farmers’ markets in the area that are quite a bit cheaper, and that is why I take particular issue with this one. But I think it is probably an issue that needs to be discussed in general as well. I just might have to drive through Ohio one of these summers to see and enjoy the produce from these stands for myself! I’ve never been to California. Would love to visit at some point. It seems to be a whole other world out there. I have a series on my blog called “Hidden and Not so Hidden Gems in Holmes County.” My goal is to post about local attractions…roadside markets, inns/b&b’s, and other local places. You can enjoy our region through my posts from the comfort of your own home until you are able to travel east. I sometimes have to remind myself that I am blessed to live in this area. When you are born and raised here you don’t realize what the draw is for the tourists. I guess it would be the same for you when people flock to California to see the sites. Oh, that sounds great! I will check it out. I forgot to mention in my reply that the prices at this market are especially high, but I guess I addressed that in the post. Other farmers’ markets have much different pricing. I want to buy local, fresh and support Altadena’s small business. I can not afford this luxury. It hurt to say that but there you are. I think this is so true for so many people. I am hoping this changes. $7.50 for a dozen eggs! Wow I wish I could get that here in Indiana. I’m lucky if I get $1.75. Of course, I don’t want to pay the $7.50. I grew up in the bay area and now live in Altadena. I still shop at the markets there and here. The prices are definitely lower there. But why? From what I observe every demographic group is represented among the shoppers. EVERYONE shops at the markets, and the farmers as a result, sell more, for less. Used to be more expensive, but basic economics changed that. The more people who decide that clean, non industrialized food that doesn’t kill us is worth paying more for, that a dozen eggs costs less than a movie ticket, a video game, a pair of shoes, a cell phone bill, a tank of gas (lots and lots of things), that eggs for 99cents a dozen are probably a really bad thing for our bodies, our children’s bodies and our planet, the lower prices will get. I grow a lot of my own food and have a dozen chickens. I know my eggs cost more than 7.50 dz. to produce, and my veggies would be very high. But I just REFUSE to support industrialized food anymore. Just can’t reconcile it ethically or morally. There is a Walmart coming to Altadena, they will have lots of very cheap food. I understand the basic economics of more people shopping, the lower prices will go. My point in the post is, that as the Altadena Farmers’ Market stands, many people simply can’t afford to shop there, whether or not they would like to refuse industrialized agriculture. For many people, it is not as simple as giving up a few video games or a night at the movies so they can buy locally sourced, organic eggs. I have no doubt it cost a fair amount of money to raise chickens. As I said in my post, I don’t think the farmers are getting rich. I have talked to many Altadena residents who had already shopped at either the Pasadena or La Canada farmers’ markets, who really want to support a the Atladena Farmers’ Market, but find that they can’t afford to. In many cases local, sustainable, organic foods are a privilege of the middle to upper economic classes, and I am sad to see this as the case of the Altadena Farmers’ Market. With a larger variety of farmers more of Altadena’s residents might be able to access such a great resource. Yes, I agree, for many it is not as simple as giving up a video game. Families who fall way below poverty level need more than giving up a cell phone bill to afford the Farmers Market. Did you read Mark Bittman’s piece a while back that spoke to the issue of inexpensive food. He did a cost comparison for a family of four making a dinner of chicken rice and beans (and how it stretched over a few meals). It was nutritious and economical, costing way less than a fast food meal, which has been justified as a necessity as it is all that the poor can afford. The poor in this country have paid the greatest price for industrialized food. I am not just a proponent of sustainability, but of food justice. Everyone, has fallen prey to the forces that market easy over healthy. The poor have just paid a greater price because when they eat out after working two shifts, it is fast food. And it is not just the poor who have accepted the idea that the first priority of food is that it be cheap. We all have, which is why Target, Walmart, Best Buy and Staples have wiped out small towns across America. In this country we value cheap above everything. It has been many generation since home ec was taught in the schools, everyone had a kitchen garden and a few chickens. The movement has to start somewhere. I was amazed last night to discover yet another Farmers Market on Tuesdays (Lake Avenue). I think there is a market almost every day of the week now. More and more people are accepting them as normal, I see a more diverse crowd at the Saturday market, every year. Sometimes things happen gradually. I wish it wasn’t that way. I wish that people would see how important this is. But I have learned over the years that sometimes I have to accept slow change. As you say, none of the farmers are getting rich, and a lot of the Altadena farmers are just neighborhood people growing in their backyards. I am not sure what they can do to lower their prices. So, those of of us who can need to support these markets so they can grow strong. The more people who use them, the lower the prices will get. It will change. Completely agree. I am in search of avenues that make sustainable, just food accessible to everyone. It is an issue that has so many facets. I agree completely. A company like Walmart pinpoints Altadena as a “food desert” and is addressing the need by putting in a Walmart grocery store. The fox sets up shop outside the hen house! As a community we need to find solutions before Walmart does it for us. Sadly, most cities still don’t have many farmers’ markets period. I live in Glendale, AZ and I have to drive to Phoenix to get to a market where much of what they sell is from out of state. Our major vendor is not participating in the SNAP program (food stamps) either, which makes me want to boycott him, but it’s all we have. Our options are seriously limited–and it’s painfully obvious the markets we do have are not intended to serve low income families. I take for granted that we do have so many farmers’ market options here is the Los Angeles area, and that I live in the state that grows an abundance of produce. I think the sustainable food movement needs to address the issue of socio/economic class. We can’t reserve these healthier choices (for people, workers, the earth) just for those earning a certain level of income. Thanks for the response–you look busy! The book “Fair Food” had some interesting stories about people confronting the food desert problem. Programs to get fresh food in convenience stores (were those living in poverty often do their shopping out of necessity) and businesses willing to risk entering a low socio-economic community are doing well. They need more government funding. The private sector could do a lot more, too–Whole Foods opened a store (modified) in some terrible neighborhood in Detroit or somewhere, so it can be done (and successfully, too). Community gardens and farmers’ markets are great–but for the short term, we need to get food to people in the most effective, realistic way possible. The poor are often malnourished and obese (what a contradiction) which is a recipe for disaster. I should get more involved. . . . I know how you feel. I have lived in the LA area for 20 years and have been to so many Farmer’s Markets. Some are just what you described others are the way it should be. I have to drive 15 miles to another town to hit the market that I find great prices, real farmers and real small farm produce. One way to make sure you are getting the real deal in Ca is to check and see if they are listed as “Certified Farmers Market” Some are not I recently found out. Let me mention…the market I go to 5 lb bag oranges $2.50. bunch carrots, celery, head lettuce $1.00 each. Avocado 50 cents. Strawberries $2.00 – $2.50 and other berries in season. Lemons 4 to a bag $1.00, Grapefruit 4 huge ones for $2.00. So you can see even the low income can afford our market. I think what this market is doing in good in its intention. The market creates a space for very small, very local farmers to sell their products. These smaller farms, perhaps on the cutting edge of sustainability, have to sell their produce for more, which I understand. However, many people simply cannot access these great food choices. While I think supporting these kinds of farmers is part of the solution for creating a healthier food system, I think it is important that we try to include everyone along the way. At which farmers’ market do you shop? While I agree with a lot of what the author is taking issue with I would ask for consideration of a few things. 1) the average American spent almost half of their income on food in the 1950s and currently only spends about 13% on food. Even entertainment is rolling in at 18% of the average income. weird right? -this is not to say that any of us are spending our money poorly, just an interesting statistic that makes me wonder what else went up so that we have so little to spend on food… my guess.. its some combo of increased housing expenses and lack of wage increases since the 70s. Farmers market pricing can seem pretty high sometimes, but its a more accurate representation of the actual cost of food production. If you can, please support your local organic grower. If you can’t, we understand and hear you. Thanks and hope to see you back at the market soon. Your points are well understood. And, from what I know of some of my fellow bloggers who have made comments on this post, they also understand the failings of our current food system. I know and expect farmers’ markets to be more expensive, and shop at them for the majority of my produce that isn’t grown in my backyard. The Altadena Farmers’ Market is highly specialized. It is a great outlet for these very small, organic producers. However, it does not serve the greater Altadena community. I can not tell you how many people were so very excited for the opening of this market, but have had to continue to shop at other near by markets. There are so many factors that have gone into the shift in what people want to/can spend on food, that I won’t even pretend to understand completely, but is certainly a huge piece of the solution. Like I said in my post, this is a very complicated issue that will have to be addressed from many different angles. We spend a smaller percentage of our income on food than any other nation. Nothing has gone up to make food prices go down–food prices have gone down and made the prices of some foods go up. Yes, it’s subsidies, but monoculture on such a large scale produces quantities of corn and soy that the world has never seen before. Most of the corn grown in this country is used for fuel, animal feed and processed food. Raising animals in factory farms and feeding them cheap corn makes cheap meat–and Americans love cheap meat. Processed food is dirt cheap. The cost of processed (corn based) food has steadily declined over the past few decades. The price of fruit and vegetables, in this same time period, has steadily increased–the only increase in food prices we have seen. My blog is our account of us trying to feed our family organic, grass fed, fresh farmer’s market food on $200 a week–about what the average American family spends. It’s not been easy, but it’s been an eye opener. I look forward to reading about the conclusions you can draw from your experience. BTW, Altadena Farmers Market now takes EBT. There have only been 7 or 8 Wednesday markets, I suppose it will take some time for them to accomplish everything. Yes, I read that. That is great news :).